ICICI Prudential Asset Management Company has filed a draft document with SEBI for the Bharat-22 exchange-traded fund (ETF). 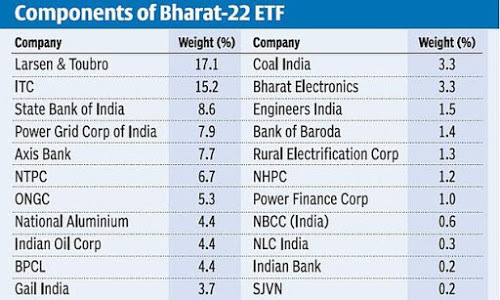 Bharat-22 will comprise stocks of 22 blue-chip public sector units, State-owned banks and some holdings in the Specified Undertaking of Unit Trust of India (SUUTI). The ETF aims to provide returns that closely correspond to the returns provided by S&P BSE Bharat-22 Index, subject to tracking error, the offer document said. Anchor investors can invest with the minimum application amount of ₹10 crore and in multiples of ₹1 thereafter. Retail investors should invest a minimum of ₹5,000 and in multiples of ₹1 thereafter, subject to maximum investment of ₹2 lakh. Retirement funds and qualified institutional investors can invest a minimum amount of ₹5,000 and in multiples of ₹1 thereafter, while for non-institutional investors (high net worth individuals), the minimum investment is ₹2.01 lakh. Investors can buy/sell units on continuous basis, in the normal market segment of the BSE and the NSE once the scheme is listed. Larsen & Toubro with 16.49 per cent is the top weighted stock in Bharat-22, followed by ITC (15.26 per cent) and Power Grid (7.85 per cent). The other higher weightage stocks are: SBI (7.76 per cent), Axis Bank (7.53 per cent), NTPC (6.98 per cent), IOC (5.56 per cent) and ONGC (5 per cent). Bank of Baroda, Bharat Electronics, BPCL, Coal India, Engineers India, Gail India, Indian Bank, NBCC (India), NHPC, NLC India, Nalco, Power Finance Corp, Rural Electrification Corp and SJVN are the other components of the index. Nearly 90 per cent of the equities included in the ETF are also traded in futures. Earlier, the Finance Minister Arun Jaitley had expressed confidence that the Bharat-22 ETF will be successful. “While creating the ETF, we have also kept in mind reforms in each of the sectors. This will have a direct impact on the valuation of these shares,” he had said. The Central Public Sector Enterprises (CPSE) exchange-traded fund (ETF was launched by Goldman Sachs Asset Management India Ltd (now took over by Reliance Mutual Fund), was launched in 2014 at ₹17.45 per unit. Currently, it is hovering around ₹27.60.